Rizzoli International Publications, 9780847841011, 239pp. Award-winning pastry chef Jenny McCoy presents her imaginative repertoire of desserts inspired by seasonality and flavor. This dessert cookbook features more than 100 delectable recipes enhanced by the flavor that only fresh fruit provides. An array of pies and tarts; cakes, cookies, and confections; ice cream and sorbet; and sweet drinks with a modernist twist are included in this user-friendly primer, which is divided into four sections showcasing each season's bounty. For the fall and winter holidays, there are enticing treats such as a Chestnut-Chocolate Layer Cake and Pumpkin-Maple Ice Cream. Strawberry-Thyme Lemonade is perfect in springtime. Summer is time for a refreshing Watermelon Granita with Lime Cream and Peach Hand Pies. Master recipes and a seasonal harvest calendar are useful components. The artful photographs of these desserts illustrate attractive presentations for sharing such luscious sweets. 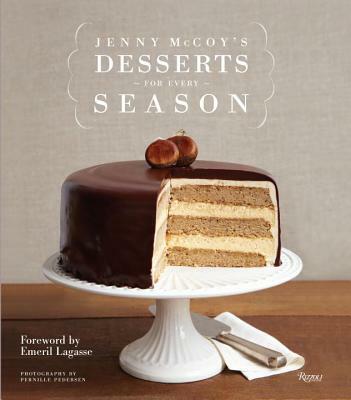 An authority on baking and pastry, Jenny McCoy has created dessert menus for such leading restaurants as Tom Colicchio's Craft and Emeril Lagasse's New Orleans establishments. In 2011, she received the prestigious NYC Rising Star Pastry Chef award. McCoy is an Institute of Culinary Education instructor, Almond Board of California spokesperson, and a contributor to Serious Eats and the Huffington Post. Emeril Lagasse is the chef/owner of many restaurants, including Emeril's and NOLA, the author of several cookbooks, and the host of the Hallmark Channel's Emeril's Table. Pernille Pedersen is a lifestyle photographer who is frequently published in The Wall Street Journal Magazine, Martha Stewart Living, and Food & Wine.